You might think that since your child only has his or her baby teeth, that you don’t need to worry about tooth decay. Unfortunately, that thought is incorrect. According to the National Institute of Dental and Craniofacial Research, 48% of children ages 2 to 11 will develop tooth decay, or a cavity, in their baby teeth. And 28% of children ages 2 to 5 develop at least one cavity. Cavity fillings, to remove tooth decay from baby teeth. Mini root canals, to remove a portion of the root’s pulp in teeth with infections. Sealants, to fix teeth that are cracked. Extractions, to remove problem teeth such as those that are blocking other teeth from coming in, or teeth with severe tooth decay. 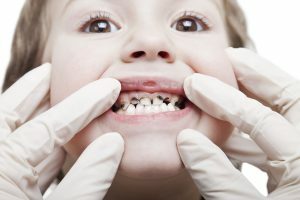 Dental procedures can cause anxiety in anyone, especially children. No one knows this better than Dr. Q, who is a mother herself. Because of this, pediatric dentist Dr. Q offers her youngest Monrovia patients nitrous oxide, or laughing gas, to keep them calm throughout their dental procedure. To prevent tooth decay in children, you need to practice good oral hygiene early. You can start out by wiping your child’s gums with a warm, wet washcloth or piece of gauze anytime he or she eats or drinks. Removing this excess food debris will prevent bacteria from growing in your baby’s mouth. You should begin brushing your baby’s teeth twice a day as soon as he or she cuts them. There are two different types of toothbrushes available for babies: a thimble-like device that goes over your index finger, and a soft bristled toothbrush. Choose the option that is right for you and your child. Pediatric dentists like Dr. Q recommend your child use fluoride toothpaste once he or she is old enough to spit it out. Swallowing fluoride toothpaste isn’t safe because it can cause teeth discoloration or a stomachache. Until your child is old enough to be able to spit out his or her toothpaste, use a fluoride-free, training toothpaste. Speaking of fluoride, you child should drink tap water to get a low dose of fluoride. If your child does not use fluoride toothpaste and doesn’t drink tap water, ask your Monrovia pediatric dentist Dr. Q for fluoride supplements, which can be taken as early as 6 months of age. Once your little one has two teeth that are touching, you should begin flossing his or her teeth daily to remove harmful plaque. You can use traditional floss, or pre-threaded flossers, whichever works best for you and your child. An additional way to avoid tooth decay is to limit sugary snacks and milk and juice, never give your baby a bottle of milk or juice to go to bed – always choose water, and take away a baby’s bottle if he or she is no longer actively drinking from it. If you suspect your child has tooth decay, call pediatric dentist Dr. Q in her Monrovia office today at (626) 599-9819.